The technique of a voice over in a film normally endears the audience to that particular person or characters point of view. 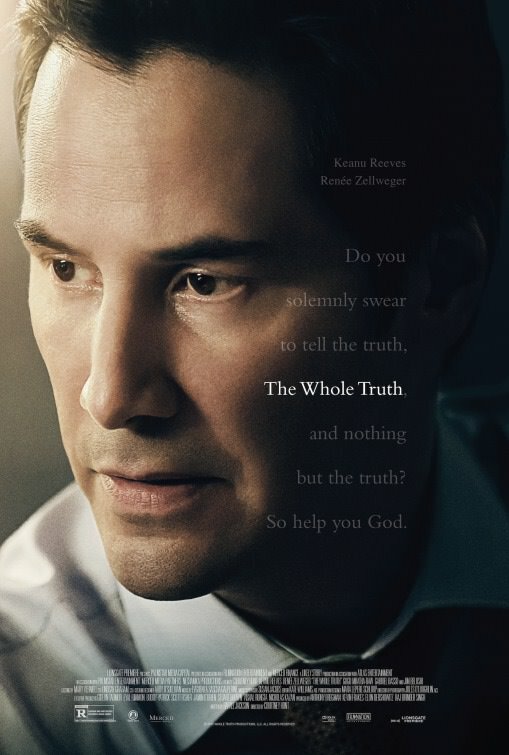 The voice over is effectively used in director Courtney Hunt Louisiana Legal thriller The Whole Truth starring Keanu Reeves (John Wick, The Devil’s Advocate and Dangerous Liaisons) as hotshot defence attorney Richard Ramsey who is called upon to defend the son of a murder victim, Mike Lassiter played by Gabriel Basso (Super 8). The murder victim is the misogynistic Louisiana lawyer Boone Lassiter played with relish by James Belushi who audiences glimpse in a series of carefully timed flashbacks. The voice and the character’s viewpoint belongs to Ramsey so immediately audience’s perceptions of guilt and innocence are framed through his skewed and cynical viewpoint. To add some diversity to an otherwise bland white middle class legal drama is British star Gugu Mbatha-Raw (Belle, Concussion) appearance as Ramsay’s second chair Janelle Brady who is suspicious of the entire legal process, not least of all Ramsay’s close relationship with the defendant’s mother the sultry yet seemingly innocent Loretta Lassiter played with sufficient mystery by Oscar winner Renee Zellweger (Cold Mountain) who is back on the big screen after a hiatus. Zellweger who has undergone a significant transformation as an actress since her performances in Chicago, Nurse Betty and her recent hits with the Bridget Jones trilogy, plays the battered Southern belle to perfection. While the screen chemistry between Reeves and Zellweger is questionable, The Whole Truth is hardly Body Heat or Basic Instinct, then the film’s startling narrative was never intended to be sexually provocative. Frozen River director Courtney Hunt is determined to explore all the legal technicalities of a murder trial including undercutting the testimony of eye witnesses and shifting the validity of a clear timeline of events which lead to the horrible Boone Lassiter being stabbed in the heart in the marital bedroom, indicative of a serious crime of passion. It is refreshing to see so many female directors making interesting films these days and The Whole Truth is certainly entertaining with its complex portrayal of Louisiana legalities. 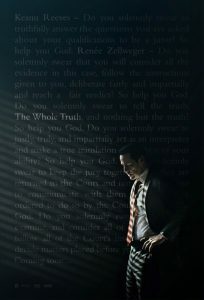 The Whole Truth is a fascinating courtroom drama, with sufficient amounts of twists and allegations to keep fans of legal thrillers guessing right up to the last frame. However, the film does not elevate itself into the realm of a truly remarkable thriller such as Richard Marquand’s The Jagged Edge with Glenn Close and Jeff Bridges or Primal Fear featuring an Oscar worthy turn by Edward Norton as the accused altar boy Aaron. In the case of Louisiana versus Mike Lassiter, Keanu Reeves’s voice over as the slimy lawyer Richard Ramsey lulls audiences into a false sense of justice. The Whole Truth gets a film rating of 7 out of 10 elevated by a notable performance by Gabriel Basso as the illustrative accused Mike Lassiter. Fans of courtroom dramas will certainly enjoy this American thriller set in St Bernard’s Parish near New Orleans.